When you are working on your PC and come up against a problem that you are unsure how to solve or want to accomplish something in application that you aren’t sure how to do, Brilliant guides give you the answers. 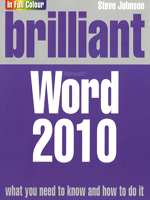 Brilliant Word 2010 allows you to find the information you need easily and without fuss. It guides you through all tasks and applications using a highly visual, step-by-step approach. It tells exactly what you need to know when you need to know it. Brilliant Word 2010 will show you how to …. Spend less time reading and more time doing with a simple step-by-step approach to beginner and intermediate level office tasks.